Apple's rapidly-expanding internal search group— aimed at making Spotlight a legitimate Web search engine— is being led by the team acquired in 2013 with social search firm Topsy, AppleInsider has learned. Topsy co-founder and CTO Vipul Ved Prakash serves as the search group's director of engineering, while Topsy product chief Jamie de Guerre leads the engineering program management team. Perl luminary Chip Salzenberg— Topsy's former chief engineer— is "reifying Star Trek" for the iPhone maker. Apple paid more than $200 million for Topsy, one of the few analytics firms with access to Twitter's "firehose," a realtime stream of each and every tweet. While Apple's intentions were unclear at the time, it now appears that the company was interested in Topsy's indexing and searching expertise, rather than anything specifically related to social media —though tweets are on their way to Spotlight. The team that Prakash and de Guerre helm is primarily comprised of former Topsy staff. Publicly, the deal first paid dividends with the release of OS X Yosemite and the new "Spotlight Suggestions" feature, which integrates information from the web into Spotlight searches and powers the suggested results seen in Safari 8's smart search field. 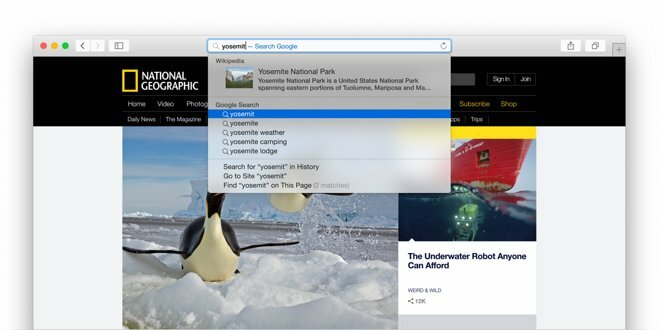 The Topsy team is responsible for Spotlight Suggestions, which also powers Safari's smart search field. Underpinning those results is a new in-house Web crawler called AppleBot. AppleBot allows Apple to index the web and deliver search results without depending on third parties, which could spell trouble for mainstream search engines like Google. Earlier on Wednesday, Google acknowledged that it has seen mobile search volume eclipse desktop search volume in 10 countries, including the U.S. and Japan. Because Google counts tablets as desktops, it's likely that the balance is skewed even more toward mobile devices— of which Apple sells nearly 200 million each year. There is ample evidence to suggest that Apple plans to continue expanding Spotlight's web search capabilities, and could eventually offer it as a general-purpose search option for iOS and OS X users. Apple has bolstered the team that came from Topsy with numerous other hires, beginning to ramp up its search efforts in 2013. The Apple Search group currently has over a dozen job openings for positions ranging from infrastructure operations to data science and location-based search specialists. "Apple's new Spotlight Suggestions service provides fast, relevant search results from the Internet in Spotlight and Safari on iOS and OS X," many of the listings read. "The Spotlight Suggestions service is built on massive amount of data crawled from the Internet, sourced from feeds and generated from user interactions with search results." By default, Apple users can choose between search providers Google, Yahoo, Bing, and DuckDuckGo. Any move by Apple to favor its own search engine for iOS and OS X could— in addition to drawing regulatory scrutiny— be a body blow to Google, which has been the default search engine on both platforms for years. Google depends primarily on search advertising for revenue, and is already seeing its share of mobile ad spending eroded by competitors like Facebook. Losing traffic from hundreds of millions of Apple device users in the midst of the mobile revolution could be devastating, and that scenario goes a long way toward explaining Google's strategy with Android. From Apple's perspective, the argument in favor of deploying its own in-house search engine is much the same as that for ramping up its own in-house maps. Apple's business depends on hardware sales, and its most lucrative product line— the iPhone— is in a market where hardware is quickly becoming commoditized. Software and services are the new battleground, and Apple can't afford to leave major pieces of its platform in the hands of competitors.